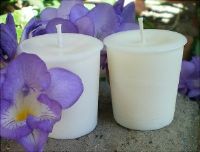 Our soy votives burn 15 hours or more when placed in a tight fitted votive holder. 2 votives with the same scent wrapped in a biodegradable cellophane bag. Made with top therapeutic grade essential oils that are from the 1st distillations; cold pressed or steam distilled, no chemical solvents. Total wax weight is 4 oz.